After a disastrous fourth-quarter earnings call on Wednesday that sent the stock plunging, Groupon announced Thursday that CEO Andrew Mason is no longer with the company. Groupon is currently searching for a replacement. Back in August, Om wrote that the problem with Groupon was that it was highly valued by investors who were hoping to get in on the big deals of the social web around the time of the company’s IPO, but that Groupon was never a technology company; even if it was valued like one. For the most part, it’s really more of an online coupon business, yet it enjoyed a whirlwind IPO and was reportedly once courted by Google to the tune of $6 billion. Groupon went public in November 2011 at in initial $20 public offering, making it the biggest U.S. public web IPO at the time since Google. But Groupon’s stock price is down 77 percent since that IPO, as it has struggled to expand and as both customers and small businesses — the fuel for Groupon’s early rocket ship — have grown weary of the daily deals business. The company’s stock closed Thursday down 24 percent following that dreadful earnings announcement, but rose 3 percent after hours on news of Mason’s departure. He has been with the company since November 2008. This piece was updated continuously on Thursday as the story developed. Since 2006 almost no single Internet startup has made it. Something is wrong with this Internet startup ‘me-too’ frenzy. And also with criteria upon which VC’s choose where to invest in. Maybe VC’s should use exactly opposite criteria for investing. This is not a good message to new startups, should they trust all those ‘in the know’ ot should they trust their visions only. My personal opinion is that too many startups and VC’s are looking for the easy money. Enthusiasm and passion to make something useful are pretty low on their list. Although Andrew Mason created a global company, his Groupon has expired. Living social was just foreshadowing for Groupon. 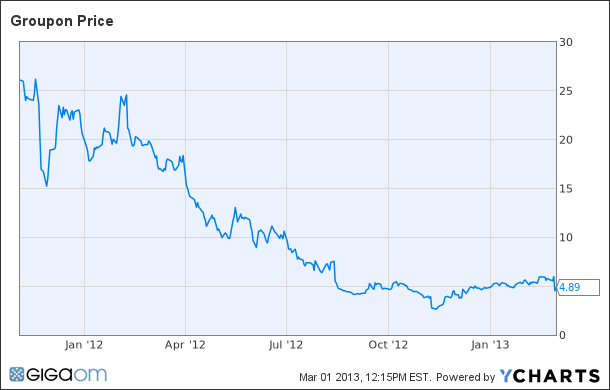 Groupon is going to remain a large company, but not up to market expectations. They just push sales on people and don’t even bother to provide any content to build loyalty. At Deal Current Network, we are seeing local media companies test and innovate on the offer space. Also local media companies can throw in TV, Radio, Print. Groupon and Living Social just have emails and will die a slow death. Good memo – inherently flawed business model with extremely high overhead that is tried to pass on to merchants in the form of high transaction fees that leads to churn and higher marketing investment which leads to profit squeeze. We saw this and created what we think is a win-win user driven commerce platform in beta at Flash Purchase.